Parking is free at Four Counties Health Services. 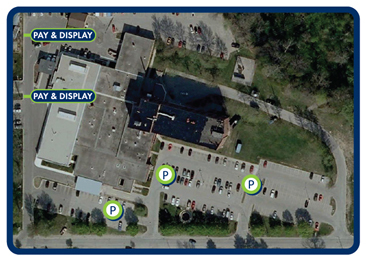 At Strathroy Middlesex General Hospital, visitor parking is available in lots accessible by any of the three Carrie Street entrances. Pay & Display parking is also available for patients visiting the Emergency Department. There are clearly designated parking spaces reserved for the handicapped. Parking along fire routes is illegal and will result in a parking violation ticket. When arriving at one of the parking entrance gates, push the green button to obtain your ticket – IMPORTANT* Take this ticket with you, and keep it with you at all times. When your visit is over, before returning to your vehicle, locate one of the parking pay stations. Pay Stations are located at the main hospital front entrance, next to the sliding doors beside the parking office. Pay stations accept credit cards (Visa, MasterCard or American Express) or cash (bank notes and/or coins). You can also purchase daily or monthly pass at pay stations, instructions are displayed at the top of the station (for the 10 visit pass please see the parking attendant office or parking brochure for options). Follow on-screen instructions to pay, and be sure to take your ticket back when prompted. You will need this ticket again at the gate exit. Return to your vehicle, drive to exit gate and insert your paid ticket. The gate will lift and you can proceed to exit. In case you forgot to pay at the pay station, gate exit machines also accept credit card payment (at this stage, you can only pay by credit card, cash cannot be accepted). Monday to Friday: 8:00 a.m. – 4:00 p.m. For assistance outside of these hours, please use the video link contact help button on either of the pay stations or exit gate machines. The hospital is not responsible for lost or stolen personal items. We are not responsible for damages sustained to any moving or parked vehicle while on SMGH property. While we are not responsible for personal property, please report any lost or damaged property to the information desk. Parking fees have become an increasingly important source of revenue for hospitals and are used to help support patient care. Thank you for your support of Strathroy Middlesex General Hospital.